Happy Fourth Birthday ‘The Daily Create‘! The birthday theme as always was repeating patterns and Jim remembered Western Wallpaper from one of his friend’s rooms when he was growing up. 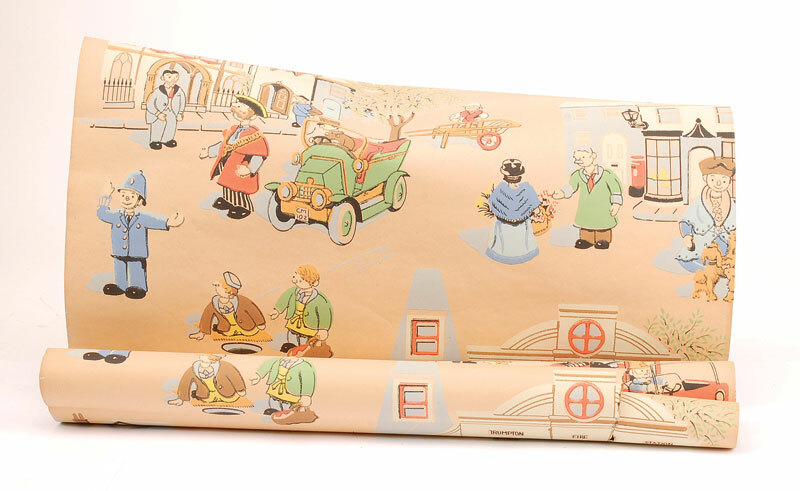 Of course, now Jim dreams of animated wallpaper! I had Trumpton wallpaper which was something like this. Daily Create TDC649. And some. 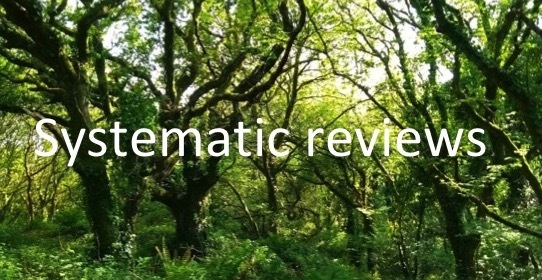 Create a photo to go with the Satirical Article someone else created for TDC 647? 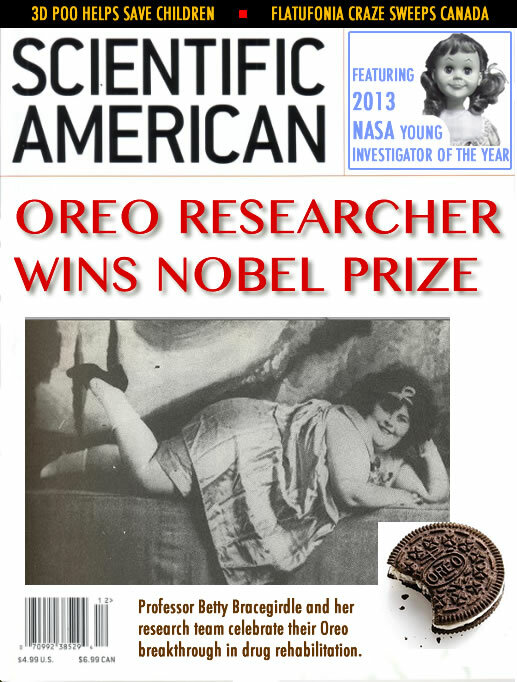 I rather liked this news story from TDC647 because it celebrated the power of the Oreo. A new study on addictive drugs has found that Oreos, which are considered three cookies in one, are as addictive as cocaine. Dr. Bill Daniels from Amazon University reported on Wednesday that lab rats chose Oreos as rewards for running a maze as often as they did cocaine. 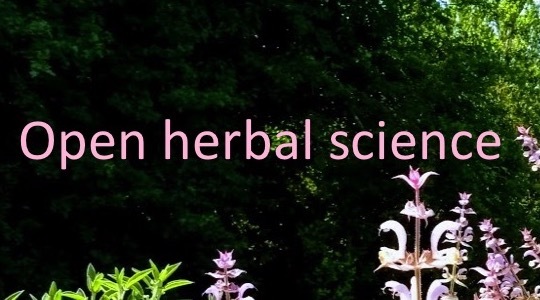 An unexpected outcome of the study was a slight weight gain by all the researchers involved. Lead researchers Dr Bill Daniels and Dr Betty Bracegirdle subsequently won the Nobel Prize for Medicine in recognition of their work. Researchers found that Oreo, in comparison to a range of other cookie brands, exhibited powerful stimuli that mimicked the psychological effects of cocaine. The modes of action were demonstrated to involve the stimulation of the pleasure centres in the brain. Other scientific news this week. Flatufonia. Is it genuine or just a load of hot air? A paper by Christiansen (2008) for the first time has alluded to the musical and medical phenomenon known as “flatufonia”. The mechanisms of action are now thought to involve ingestion of vast quantities of pickled eggs and craft beer, resulting in gaseous emissions of unparalleled volume from the buttocks. Coupled with a rare mutation of the sphincter gene BUT-1, those bestowed with the gift of “flatufonia” can blow out candles at a distance of ten yards. If you are Danish you can read more online. (Christiansen 2008). In a paper by Saps et al 2013, the researcher and his team have demonstrated that 3D poo models produced an effective means of assisting gastric diagnoses in children. The current diagnostic scale – known as the Bristol scale – is not so child friendly, and the new poo models will provide a much better means of stool assessment. It is understood that pet food manufacturers are also interested in the new model. DS106 participant and x-Waltham scientist V Rolfe (oh, that’s me), thought that the models might help with poo scaling in the development of new dog food. In one of her previous publications (Rolfe VE et al 2002) she discussed the limitations of a scale based on photographs alone. Using small plastic beads she was able for the first time ever to show a relationship between poo consistency and whole gut transit time. You can try this at home using sweet corn. Laboratory research equipment used in the trial. NASA 2013 Young Investigator of the Year! It’s a long way to Tipperary, but how long? The answer was 7,547 miles. How deep is your love? 3.7 cm. When will I see you again? When the pubs shut. DS106 #4LIFE. Or is it? Yes. Unusually, Mssss Talky Tina was unusually untalkative and was unable to provide a quote. Which was very unusual. Mssss Tina in her laboratory. A quick daily create to combine two patterns into one photo. Well, neither a dog and a corn field are particularly patterns but I suspect it is what Spike might have been thinking a the time. I was just putting him in the car to go and live with a friend because I’m renting and can’t have him. He is about 300 miles away as I write. He jumped onto the sofa and looked just how I felt. I hope he doesn’t miss me as half as much as I miss him. 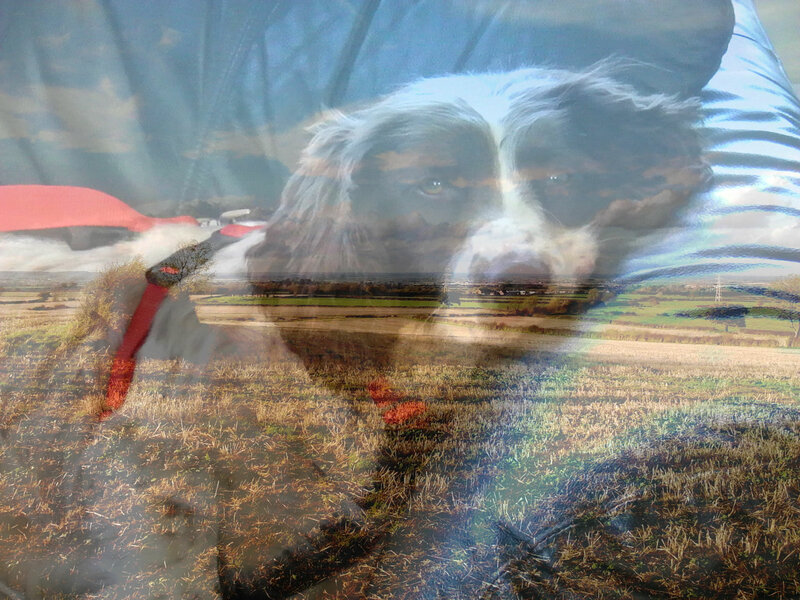 I like to think that dogs dream and can imagine themselves out in the fields. He now knows the sound of my car and when I pull up to see him he runs to the door. Its been so long since I’ve seen him I start to think I’ll never see him again. [Method: simply two images were combined in Fireworks. The field of corn was given more contrast. Spike was placed over the top at about 50% transparency. 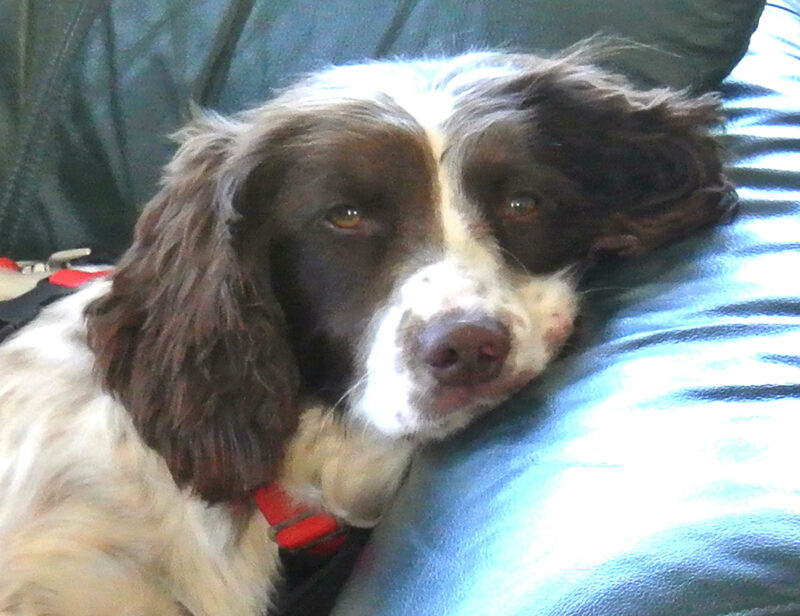 Spaniel dreams]. Kneesupland. Gateway to the South. Kneesupland is located in the east end of Margate (pro. Margit), near the end of the Kentish gyratory. It marks the bifurcation of the bus terminus and the old tramway, although much was destroyed after the Great Sewerage Leak of 1956. 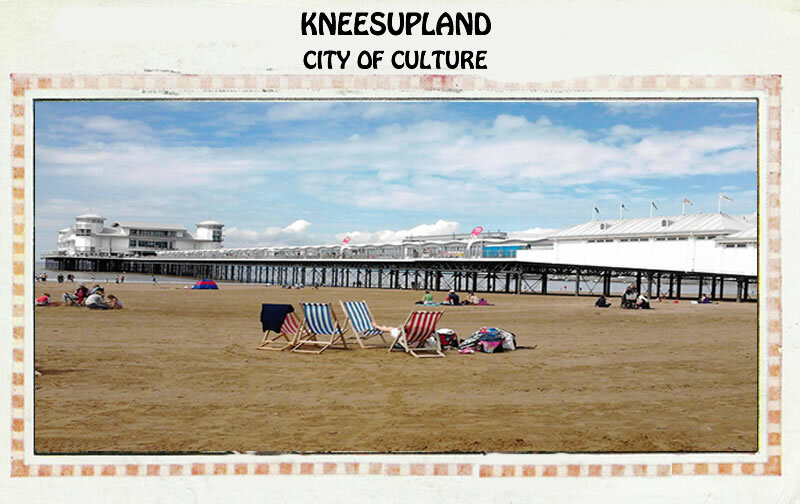 It emerged as a popular holiday resort, resounding to the slogan: “Don’t forget your bucket and spade and cossies and all”. Early postcard. “Wendy and a friend”. There are two theories regarding the name of Kneesupland. The first was that the town was named after the romantic hero, Thomas Knees, who after raiding and marauding in the north, brought back wealth and prosperity to the region through sales of flat hats and whippets. The second notion was that the town was named after a local woman, Pint-a-Guinness-a-day-Flo, who started dancing in a new way in 1917. Typically, this involved standing in a large circle with your arms around the person next to you and kicking your knees up. 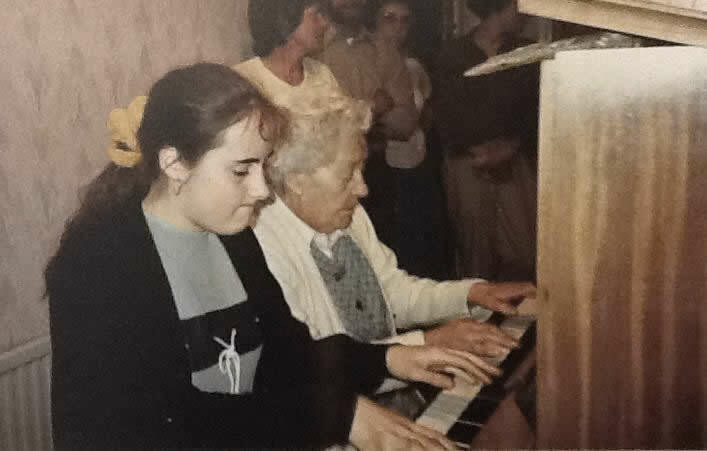 Any location was good for a right old knees-up, and most homes had a piano (pro. piana; Cockney slang. old joanna), so many a knees-up sprung-up in front parlours of the day. 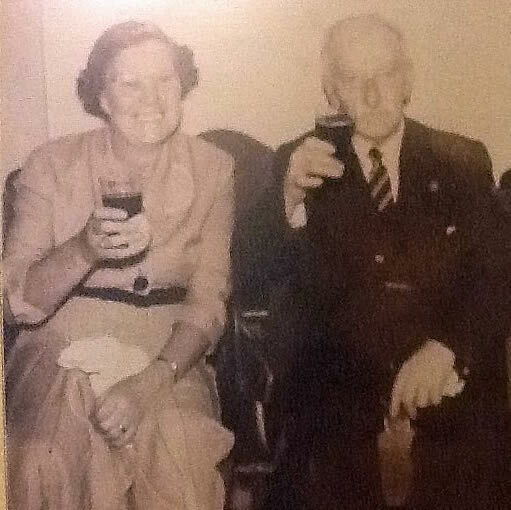 Flo with her father Water Grasmeder circa 1918. Flo (right) and grand daughter DS106-er Viv Rolfe (left) circa 1982 at a knees-up. 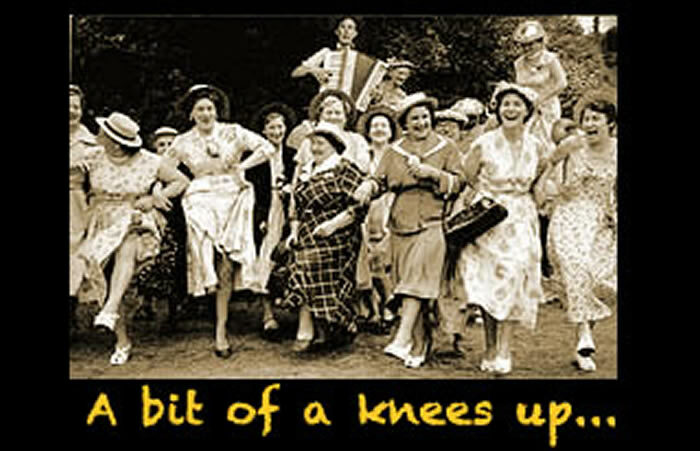 By 1920 knees-up was reported to have gone viral, with Rispanna and Justine Bieber doing knees-ups in their latest videos. But the knees-up didn’t stop there. Following the dance craze was an entire new style of musicianship, orchestration and instrumentation. 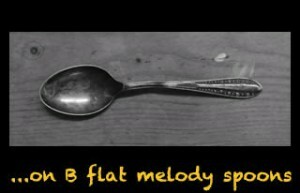 The development of the “melody spoon” in the late 1920’s, fuelled an entirely new music genre which was to last well into the next millenium and beyond. Below is an early example of “B flat melody spoon”, and you can see the evidence of lasting damage from rampant spoon-playing and tea-time Uri Geller impressions at the dining table, with several indentations to the shaft. B flat melody spoon, silver-plated- circa 1967, reportedly belonging to DS106-er Viv Rolfe. The knees-up utilizes contrast that keeps the audience interested. At no time are people watching inclined to zone out and go down the pub. Example of a right old knees-up. The dance refines the best of angular, curvilinear, consonance and dissonance. Highly ordered, the knees elevate asynchronously in ambidextural discondibularity in time with the contrasting off-beat motifs of the music. Use your knees to express your emotions. What are you trying to portray? A simple romance? Relationships to someone in the past? Rheumatism? Dancing is destroyed. Somebody must do something! By the 1950’s, dancing as we knew it was utterly destroyed. Dancing was broken. The knees-up took over the dance floors and extended its influence in other areas. Hollywood embraced the knees-up, and the knees-up became part of cultural identity across Europe. (Left) Fred Astaire with his 1946 Oscar-winning knees-up routine. 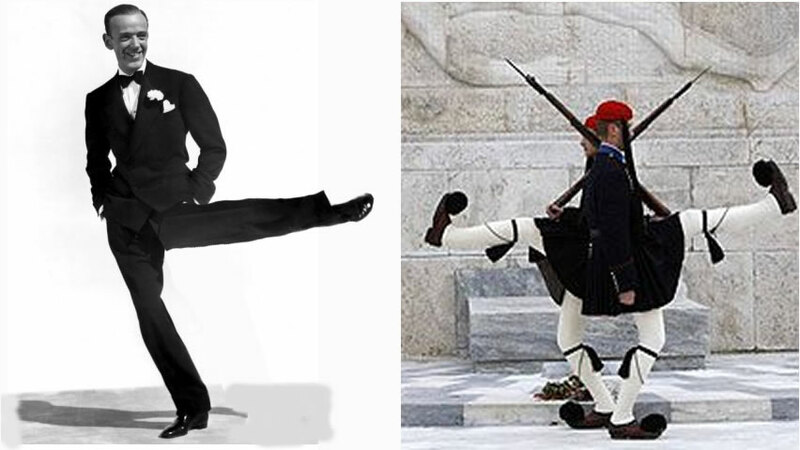 (Right) Elite knees-up ceremonial unit in Greece. Much music epitomises the knees up, none more so than the genre of Cockney Fusion. 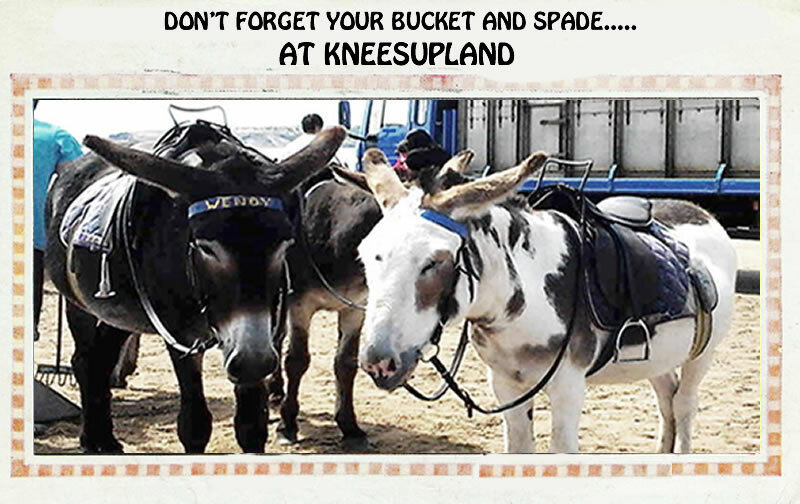 The future certainly looks bright for Kneesupland. The old sewerage works have now been turned into a shopping centre, and the tram and train lines are now cycle paths. Thanks to the musical and dancing heritage, the area is leading Margate’s bid for City of Culture in 2017. Such local efforts are giving rise to a clean out of the dead pigeons from the fountain in the town centre, planting of petunias in the cemetery, and re-grouting of the toilets near the Station Road dry cleaners. DS106 Video yourself singing a verse of your national anthem as fast as you can. I was informed by reliable sources, reliably, in a reliable manner, that our English National Anthem was indeed a mediaeval tune originally played on lutes and sackbuts. After an in depth and precise programme of research I can confirm that my reliable source was unreliable, and the anthem was originally indeed based on an old English knees-up. I can also confirm when looking up sackbut on the internet, one has to be exceeding careful. I therefore decided to take our dear anthem back to its roots and to explore its heritage. I think you will agree that the counterpunctual electro-plated harmonies in the rhythmic sections really bring out the nuances of the tune.